My guesses were satisfied , the location is perfect , lovely bar and restaurant , I don't know how was their facility inside the hotel but they told me the place was clean and comfortable . Excellent location. Friendly staff. Very spacious apartment. 2 bedroom apartment was perfect for our family of 4. The apartment had all the amenities you need for a comfortable stay: fully equipped kitchen (w/appliances, cookware, and utensils); washer/dryer; full size ironing board and iron; TV and DVD player...The hotel is in a great location! We were walking distance to St. Stephen's Basilica -- you could see it from our balcony! Plenty of shops and restaurants nearby (some open late/24 hours). 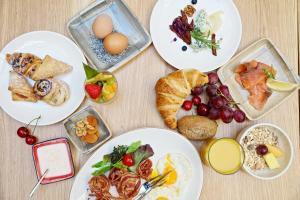 We took advantage of the hotels partnership with Restaurant Autré. We got a round of free drinks, a 10% discount on à la carte menu items, and the food was incredibly delicious (and very reasonably priced)! The staff was friendly and very helpful. We will definitely stay here again the next time we visit Budapest. Location was awesome, restaurant was quite good, staff was friendly, quiet. The location was great! Lots of places to eat near by. The staff was very helpful. The decor was modern, nice and the beds were comfortable. 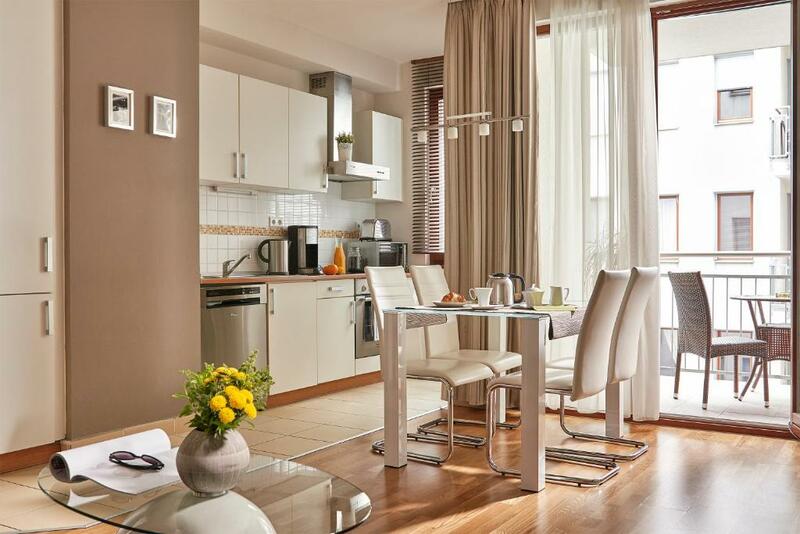 Lock in a great price for 7Seasons Apartments Budapest – rated 9 by recent guests! 7Seasons Apartments Budapest This rating is a reflection of how the property compares to the industry standard when it comes to price, facilities and services available. It's based on a self-evaluation by the property. Use this rating to help choose your stay! One of our top picks in Budapest.Featuring a 24-hour front desk and daily maid service, the 7Seasons Apartments offers spacious 1- to 3-bedroom apartments in the heart of Budapest, only 350 feet from Deak Ferenc tér, which is a major public transportation hub. Wireless internet access is available in all apartments free of charge. A shuttle service can be requested for a fee in advance. All apartments feature a kitchen to prepare your own meals, but you can also find lots of cafes, restaurants and a 24-hour grocery store in the immediate vicinity of 7Seasons Apartments. St. Stephen's Basilica, the Great Synagogue, the State Opera House and the Hungarian Parliament are easily reachable on foot. 뀐 Located in the real heart of Budapest, this property has an excellent location score of 9.6! 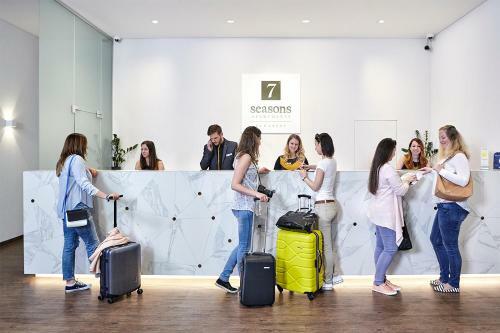 When would you like to stay at 7Seasons Apartments Budapest? 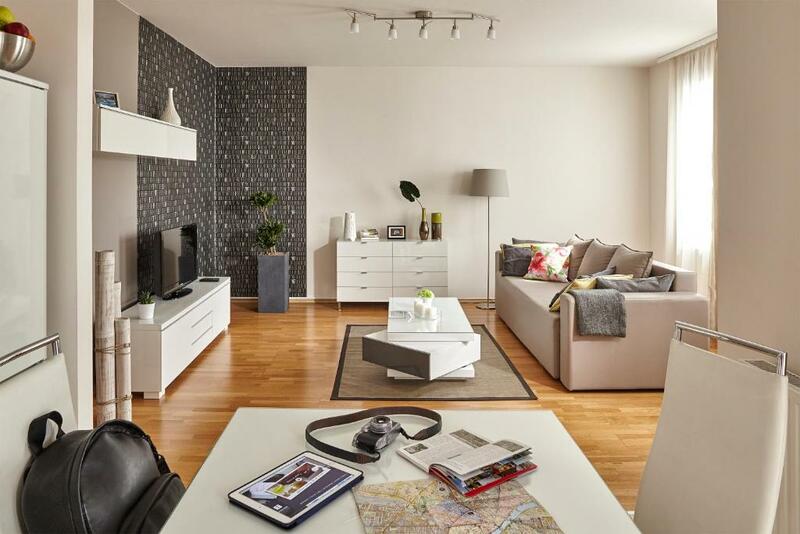 This air-conditioned apartment with a double bed, a sofa bed, a living room with a dining area, a full kitchen with a dishwasher, a bathroom and a balcony. It features a washing machine and a flat-screen TV. Air-conditioned apartment with a double bed, a sofa bed, a living room with a dining area, a fully equipped kitchen with a dishwasher, a bathroom and a balcony. It features a washing machine and a flat-screen TV. Please note that extra beds/cots are not available in this room type. Large, air-conditioned apartment with a double beds, a sofa bed, a living room with a dining area, a fully equipped kitchen with a dishwasher, 2 bathrooms and a balcony. It features a washing machine and a flat-screen TV. Please note that in these apartments there are 2 bathrooms, but only 1 toilet. Air-conditioned apartment with a double beds, a sofa bed, a living room with a dining area, a fully equipped kitchen with a dishwasher, 2 bathrooms and a balcony. It features a washing machine and a flat-screen TV. This air-conditioned apartment has double beds, a sofa bed, a living room with a dining area, a full kitchen with a dishwasher, a bathroom and a balcony. It features a washing machine and a flat-screen TV. Air-conditioned apartment with double beds, a sofa bed, a living room with a dining area, a fully equipped kitchen with a dishwasher, a bathroom and a balcony. It features a washing machine and a flat-screen TV. This air-conditioned studio has a queen bed, a living and dining area, a full kitchen with a dishwasher, a bathroom and a balcony. It features a washing machine and a flat-screen TV. This double room has a kitchenware, dining area and electric kettle. Baby cots and extra beds are not available in this room type. This studio features a balcony, dishwasher and electric kettle. We are not an ordinary hotel, and not a simple aparthotel. Our goal is to combine the best features of these two to provide you with the ease of a hotel and the comfort of a home. We are very much awaiting to welcoming you at our spacious, non-stop opened reception, where you will always get the most helpful, interesting and useful information related to our beautiful city. 7Seasons Apartments Budapest love families and always warmly welcome young people at our apartments. We provide special facilities for the families to serve their special needs: babycot, high chairs, kitchen facilities for babies. 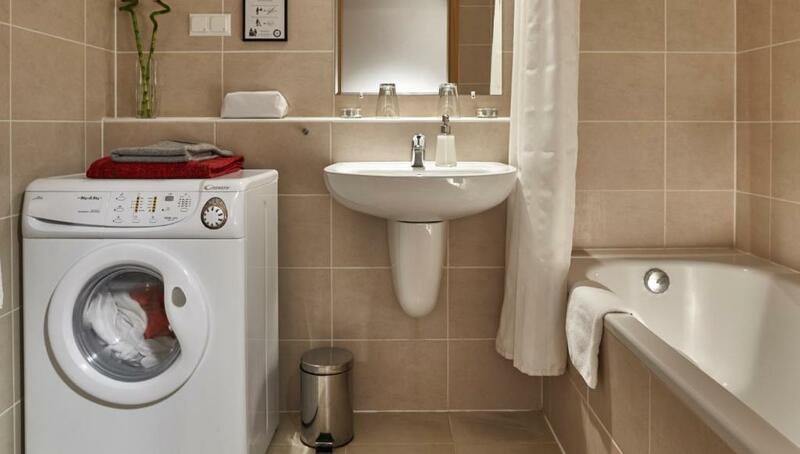 Our apartments are situated right in Budapest centre, in the historical quarter of the capital, only a few minutes walk from Andrassy Boulevard and Deak Square, near to the most famous touristic and world heritage sights such as the St. Stephen Basilica, the Synagogue and the State Opera House. The Hungarian Parliament, the Chain Bridge with the breathtaking view to the Danube and Buda Castle or the Heroes Square are also in a short walking distance. House Rules 7Seasons Apartments Budapest takes special requests – add in the next step! 7Seasons Apartments Budapest accepts these cards and reserves the right to temporarily hold an amount prior to arrival. Please note that cash payment is possible both in EUR or HUF, and that the conversion is made at the foreign currency selling rate of the bank where 7Seasons Apartments has its account. Payment form is required for reservations which require prepayment. The guest needs to show the same credit card upon arrival. Please inform 7Seasons Apartments Budapest of the number of guests arriving (including the age of children). Please use the Special Requests box to provide this information when booking. The apartment will be prepared for the number of guests indicated. Added costs for children and additional guests are not included in the reservation price and need to be confirmed by the property. Please be informed that the air conditioning is only available from 1 June to 31 October. Please note the hotel will pre-authorize the credit card with the amount of the first night. If the credit card is proven to be invalid, you will have 24 hours to provide the hotel with a new valid credit card. Your reservation will otherwise be canceled. Please inform 7Seasons Apartments Budapest of your expected arrival time in advance. You can use the Special Requests box when booking, or contact the property directly using the contact details in your confirmation. Clean apartments with little extras that really helped- tea, coffee, clean towels every day, unlimited loo roll etc. tooooooo many dust remaining unclean!! although we let the cleaning service in everyday!!! we started cleaning by ourselves so we dont get dust allergies!! I didn’t like the fact that there was nobody to help us take our luggage upstairs when we arrived. I liked the fact the kitchen and living room space was an open plan. Really not happy that at the end of the stay a 12% 'service charge' was added to the entire cost of the stay (12% after their VAT, actually I later realised they had charged 13%). This was not communicated when booked and also was not optional. When I asked them to explain what the cost was for they told me reception and cleaning of the room - something I've never been charged extra for at a hotel or apartment. A 13% extra charge on a 3 night stay is ridiculous - even air bnb charge a flat rate for cleaning. Location was great, among lots of bars and restaurants and very central. Free welcome drink was a nice touch.